Rabbit Stew: Hunting Ethics: Guaranteed Ethical. 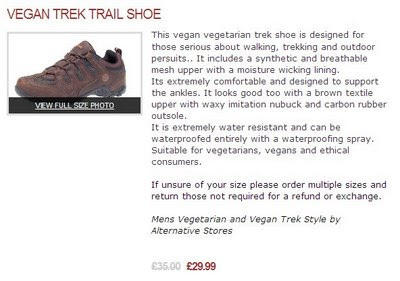 I was clicking links the other day - like you do - and came across this advertisement for a pair of outdoorsy trainers; I noticed that these particular shoes are recommended for 'vegetarians, vegans and ethical consumers'. I've seen ads like this before, of course; I've even - back in the day when I was a vegetarian myself - wandered round a shop in Covent Garden devoted entirely to footwear that excluded leather or any other 'animal products' from their manufacture. At the time, as I say, I was myself a vegetarian; my vegan days were years behind me but I still had the functioning remnants of the veggie/vegan mindset operating within me as a sort of conscious pilot with which to navigate the - as I saw them then - rocky shoals of consumer purchase choice. Minimising 'harm to sentient beings' - this a nod to the Western Buddhist backbone of my thinking at the time - was a clear priority. Still, I didn't buy anything from the ethical footwear shop, it was all too expensive: Naugahyde Birkenstocks were, as I recall, about a £100 a pop. So it was interesting for me to chance upon this ad and be given the opportunity of gauging the distance that's been travelled between what I can but call 'mindsets' - in this case, my own: the distance between what I thought then and what I think now. The first thing that comes to mind, now, about this ad is that I notice - to risk stating the dazzlingly obvious - that, one: it's written and, two: it concerns itself with ethics - with questions of how we are to lead the good life. It's a written claim about an action - buying a pair of outdoorsy trainers - that comes with a built-in guarantee about how this action relates to the effort to walk the path that leads to the good life. Buying this pair of trainers, it promises, is fully in accord with walking that path; it is an action suitable for ethical consumers. I'm reminded for some reason (perhaps because I've spent so much of my life working in mental health projects) that these days, if you go to your doctor and say 'Doctor, I'm depressed! ', what the doc will quite often do is silently hand you a piece of paper with five statements written on it - each of the statements followed by a tick-box - and a Biro. You'll be asked to read the sentences on the page and inscribe a tick next to the one that is most nearly a written précis of your own mental state: 'I feel fine and dandy' being, in effect, statement number one and then increasing gradations of anguish will lead all the way up to 'I am actively involved in planning a bloody rampage and/or self-slaughter' at statement number five. The box you tick, then, determines the 'treatment path' that the doctor will offer you: counselling, medication, incarceration - or some variegated mixture of all three. All of this with no need for an untidy verbal discussion to sully the air of the consultation room or take up precious seconds of the general practitioner's costly time; a procedure concerning questions of life, death and happiness on earth, all taking place in a scholarly - if rather unhappy - silence. The next thing that comes to my mind (and it's interesting to me because I'm conscious that what I want to write is 'and I make no apology for this' which suggests that - precisely - I feel as though I do need to make some sort of apology for this) is remembering the scene from (I had to do a Google to find where it was) John's gospel where Christ, in the midst of a discussion on ethics, bends down and writes in the sand at his own feet. I think about this part of the gospels a lot these days: Christ writing in the sand. Not writing a new commandment; not writing new guidelines vis-à-vis adultery, theft or murder; not writing anything that could be preserved and consulted as a new and binding book of the Law (there was already in existence a perfectly acceptable book of the Law, one that Christ is portrayed as saying that he came to fulfil, not destroy) but making, instead, a distinction regarding the gap between what the written law decrees and what a living person who is in themselves the perfect fulfilment of this law, what that living person would say and do in response to questions of this kind, the steps they would take. The law says that adultery requires the severest form of punishment? Well, sure (pause to write in the sand) those of you who haven't broken these laws, you go ahead and throw your rocks. The life that is the perfect fulfilment of the law, the actual steps that are taken along this way to the good life, perhaps this isn't, then, something that can be wholly written down? Perhaps it can't be completely reduced to marks on a page - perhaps it may even have something of a paradoxical relation to the written law, may perhaps, at times, even appear to contradict it? Coming back to footwear, then, I suppose that what I quibble about in the suggestion implicit in the ad for the trainers is that the case is closed - written down, finished with - regarding the supposedly crucial ethical question of animal products in consumer goods; the case is closed and the answer is 'no' - the path to the good life cannot be walked by those whose feet are clad with leather shoes. This is now, we understand, a given and, as such, it's possible to write this maxim down and consult it, should doubt arise, for reference in the future. As in the doctor's surgery, the air need no more be disturbed with talk regarding these questions: a simple tick in the right box will suffice and then it's done - we don't need to talk about it any more, we can just get on with doing the 'right thing': buying the nylon shoes, taking the Prozac, throwing the rocks - whatever. I know a man who makes shoes for a living; he writes a blog about his hand-made shoes. Most of the shoes he makes are made out of leather. Am I willing to accept that, because these shoes are made out of leather, then these are articles of footwear that no 'good' person could ever wear? No, of course I'm not; that'd be nonsense. I certainly hold plenty of nonsensical beliefs, but this isn't one of them. But if I happily swallow the notion that these particular 'Vegan' trainers are suitable for 'ethical consumers', aren't I accepting that it's right to understand that shoes not made along these lines are in some way 'unethical'? More importantly, am I not also accepting that I agree that this is a good and a useful way of understanding what ethics itself is - that truly ethical behaviour need only concern itself with a choice between statements on a written list? I suppose I think - tapping away here, in my stocking feet, in the hush of my carcinogenic-smoke-filled lounge - that, instead of quietly accepting the idea that 'ethics' is something that can be wholly addressed by reference to a set of 'yes' and 'no' statements - nylon: good; leather: not good - that it might be 'good', instead, to talk about this stuff a bit more; to sully the air with a little discussion, say - rather than accept too swiftly a ready-made template about what's good and what's not good for us to do in our lives. I often drop you a line to tell you how much I enjoy reading your blog. Maybe I've boxed myself into a corner, my effusive appreciation has left me with few options for further praise. Man, I really like your blogging. Great writing and though provoking subjects chosen.